Organic food is the best way to keep a healthy, active and sound life. The cult for organic food has been recently popularized, although it has been the ideal remedy and for centuries back. Changing your diet to organic can truly mean the world, especially if you have in mind the harmful and life threatening substances that artificially grown products contain. Rich in pesticides and other poisonous substances, both farmed animals and farm foods are a serious hazard for the human health. On the other hand, organically raised farm animals and food products are all natural, providing only the best and healthiest substances a person needs to keep their health optimal. According to the FDA the biggest threat, when farm animals are concerned, is chickens. Raised in an unhealthy, forced environment, chickens can produce meat and eggs full of dangerous substances, which are often alarming for the health. 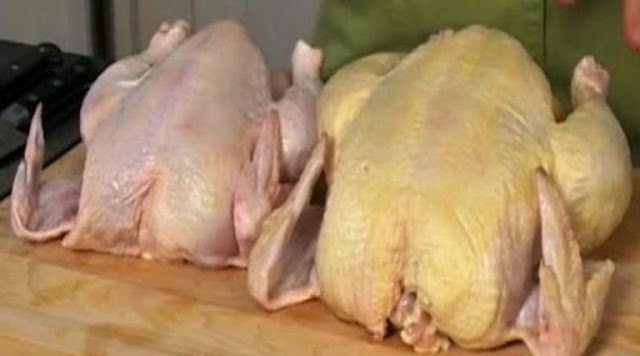 The worst substance found in farm-raised chickens in arsenic, known to cause cancer in numerous cases. Arsenic represents a chemical element, which may be of organic or inorganic background. Both versions are quite unhealthy for humans and animals; however, the inorganic arsenic is far more harmful and is proven to be cancer- triggering. Certain foods or everyday habits may easily lead to inorganic arsenic exposure, including drinking polluted water and consuming particular food products such as fish, shellfish, meat, dairy products, and poultry. Ultimately, extreme exposure to inorganic arsenic can be lethal and result in death. Other indicators of arsenic presence involve skin pigmentation changes and cancer. Arsenic and its general structure have been declared poisonous and cancer-forming by the International Agency for Research on Cancer (IARC) and are mostly found in certain food products and tap water. As far as cancer goes, the most frequent, arsenic-provoked cancer for is skin cancer, whereas in some cases bladder and lung cancer were also noticed. The first cancer manifestation as a result of arsenic exposure is noticeable within the first years of the direct contact with the chemical. Chickens and their fabricated diet are very often full of organic arsenic, which can easily transform into inorganic arsenic and cause severe health problems. Additives in the chicken feeding process are mainly responsible for transforming the somewhat less dangerous, organic arsenic, into the farm more dangerous, inorganic arsenic. For this reason, researchers from the FDA’s Center for Veterinary Medicine and the Center for Food Safety and Applied Nutrition became dedicated in discovering the levels of arsenic found in chickens. Their research led to discovering evidences of inorganic arsenic presence inside the chicken meat used for consumption. Substances, responsible for this occurrence, include 3-Nitro and arsanilic acid, commonly used for encouraging weight gain in animals. Furthermore, traces of carbarsone were also detected; this substance is responsible for preventing animals for getting infected. Once these records were announced, the aforementioned substances were excluded from further usage. Despite these efforts, certain additives are still continuously used in chickens’ diet, in order to accelerate their growth- one of those substances is known as Histostat, and is also rich in arsenic. Chickens are bound to contain arsenic, whether they are organically or farm bred. However, there are some methods which you can enforce in order to reduce the intake of arsenic. One way to do this is to completely change your diet to organic and pay attention to food labels. As one survey, carried out by the Institute for Agriculture and Trade Policy stated, almost three quarters of the farm bred chickens contain high levels of arsenic, whereas in organically raised chickens the chemical was found in only one third of the chickens. To sum up, although avoiding arsenic completely is not probable, switching onto organic products and drinking safe and tested water, can contribute to preserving your health and limit the toxin exposure significantly.